Wade wants to Snap that Stigma! Meet Wade, he is a CREATE Young Consultant who wants to make a change for children and young people around Australia who are living with a disability and who have a care experience. 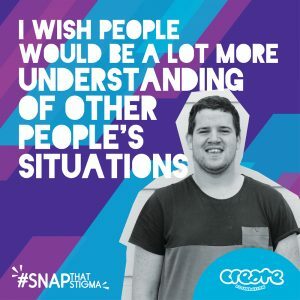 Wade is one of the seven Young Consultants who have shared their experiences, hopes and dreams as part of CREATE’s new Snap that Stigma video – You are just like us. Wade has shared some of his own personal journey and how he feels the community can be more inclusive. I’m Wade, I’m 22 years old and I am currently living in Albury NSW. I was born in Tasmania and I am the second child of four siblings. When I was young, we left Tasmania and moved to a small town in NSW where I grew up and went to school. I was in primary school when the police came and removed me from school and placed me in the hands of Department Of Community Services. When I was moved from the primary school I was attending, I was placed with a lady who I stayed with for a couple of months, so I could go to school. After a few months my placement broke down and I was moved to Deniliquin NSW which is where I spent a lot of my years in foster care. I lived with a family in Deniliquin NSW where I was the only foster child. I went to high school and gained my High School Certificate whilst I was in the care of my foster family. By the time I turned 18, I had already finished school and I was ready to step out into the big world. I moved to Albury NSW into disability supported accommodation which I really benefited from, especially with the support I was getting. I then moved into independent living which really made me a proud and happy person. Some examples of stigma or barriers I have faced in my lifetime would be during school. I was bullied because I was in foster care and people just made fun of the fact that I was a foster kid. I really felt like I was getting eaten up inside. It made me feel like I didn’t want to attend school and sometimes I would fake that I was sick so I didn’t have to go to school. Some of my strengths are my happy and friendly personality, I love helping people – if I see someone who may need some help with something I’m more then happy to help them out. It doesn’t matter what they need, I’m more than happy to help. Some of my major achievements are being awarded certificates at TAFE, gaining a job at the local disability care provider, getting selected to play for the local football team and being asked to help out at the local disability school.). I’ve also volunteered at the local base hospital, the state emergency service, and St. Johns Ambulance. I think people can be more inclusive of other people by being a lot more understanding of peoples’ situations, not to be straight to the point (in that, I mean not judging). Let people with a disability have more opportunities.